Description taken from Goodreads. I received an advance copy of this book, released June 16th, 2015, from the publisher in exchange for an honest review. These opinions are my own. If that was not a powerhouse of a novel, I don’t know what was. Powerhouse definitely was NOT the word to describe EVERY LAST WORD for the first half-ish or so. In fact, the slow pace just about killed me. That, and the fact that there was way too much going on at once, especially as the story went on towards the middle and end. The only thing that kept me going was Stone’s writing and my interest in Samantha. EVERY LAST WORD is an amazing look at a girl with OCD. Not comical OCD, not low-key OCD, but in your face, uncontrollable OCD. There’s nothing pretty or funny about it, and that’s what makes this novel. I don’t even know where to begin with the picture that Stone painted with this novel. It doesn’t just talk about OCD and mental health, but bullying, fear, self-image, peer pressure, healing and real friends. On top of the great themes, Stone’s prose is just as good as it’s ever been, even better. It wasn’t just Sam that made this all possible. It was the way she got to know AJ, the love interest of this novel, and the way that he accepts her and they learn from each other. Their relationship isn’t easy. It’s heartbreaking in the same way that Sam’s situation is, but they learn to cope with it. Overall, if you’re a contemporary fan, I would recommend this to you. 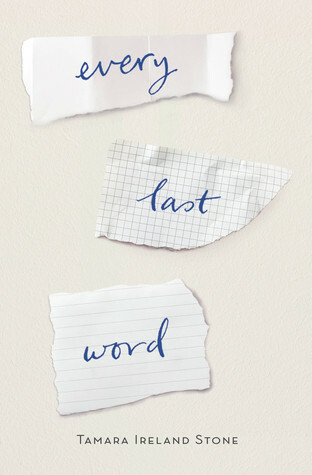 The last half of this novel shines, and it’s perfect for fans of Ann Aguirre’s The Queen of Bright and Shiny Things or Jennifer Niven’s All the Bright Places. Even if you aren’t a fan of verse, this story is definitely worth a read. 3 stars.